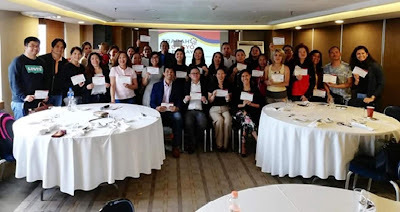 THE Department of Trade and Industry (DTI)’s Philippine Trade and Investment Center (PTIC) in Mexico City, together with the Philippine Embassy in Mexico, has conducted the first Trabaho, Negosyo Kabuhayan (TNK) Seminar in Latin America on December 9, 2018 at Mexico City’s Galeria Plaza Reforma Hotel. The TNK Seminar is an initiative of the DTI, in partnership with the private sector, the academe, civil society organizations, and other government agencies. The department aims to generate jobs and promote entrepreneurship among overseas Filipinos by providing them with information, contacts, and other necessary resources through the seminar. Consul Ma. Carmela Teresa A. Cabreira opened the program and welcomed the participants in the seminar. It was followed by a presentation of TNK and DTI entrepreneurship and innovation programme by Commercial Counselor Vichael Angelo D. Roaring. Thirty-seven members of the Filipino community in Mexico joined the seminar, in which an insightful exchange of experience took place. Carlo Malana, member of the Filipino community and senior executive of AT&T, gave attendees a motivational talk on financial literacy.